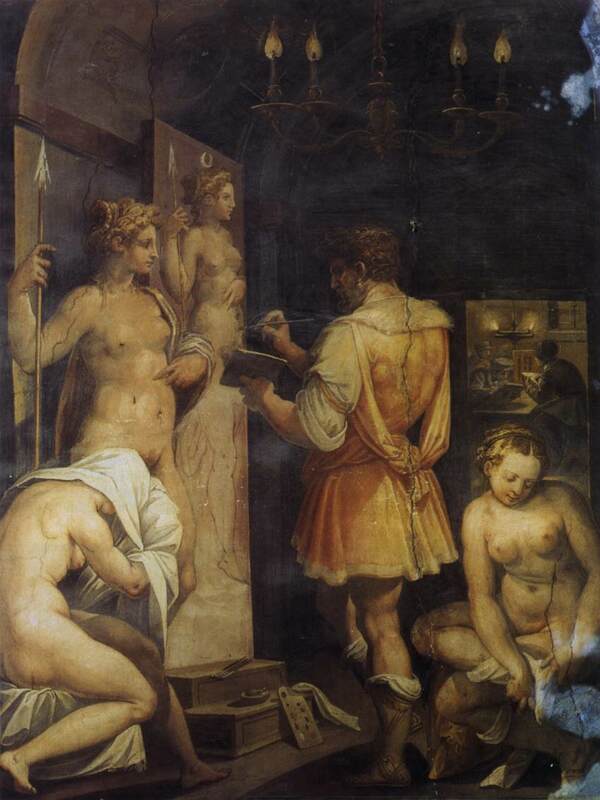 Giorgio Vasari, The Studio of the Painter, c. 1563. Humans have voyeuristic cravings that might be sated by biographies or memoirs, shelter magazines or house tours, reality TV or talk shows. It is this sort of craving that encourages art lovers — whether they make artwork themselves or not — to peek in with curiosity at the tools of an artist, to observe how things are arranged, to glimpse projects underway, to look at sketches tacked to walls, to see all these things as harbingers of finished works to come. But studio visits are more than mere acts of voyeurism. Generally, they are a conversational confluence of an artist’s sharing of perhaps recent works, a visitor’s responses to the same, and an artist’s reactions to the visitor’s insights and claims. In visiting an artist in his or her work space, one can sometimes see how the space, light, and materials that surround and become the work might also influence and extend from it. Artists willing to have visitors should gain something from such interactions. Since gallery openings are not always the most opportune moments for them to field probing questions or receive carefully considered feedback, most artists appreciate the observations and exchanges that come about at other times, in other places. If that place is also where they make their work, it is likely that conversations and critiques will be significantly richer. These studio visits are intended to extend the dialogue between artists and thoughtful viewers, and to consider an artist’s space and its relationship to the works created therein. We encourage you to extend the dialogue further, into the comments section, to make this space, too, one where artists and viewers can discuss artworks and creativity. All of the articles in here are beautifully written and most interesting, but I especially love the studio visits. My wife Loretta and I know of an artists’ studio in Philadelphia — 5 stories and almost an entire city block of painters, sculptors, ceramic artists, photographers, couturiers, jewelers, even architects — We enjoy visiting on the two or three open houses they organize each year. They are, of course, commercial occasions — the artists are hoping to make some sales, and we are hoping to find something to take home — but there is also a chance to hear from the artists and to comment positively on their work. Reading these visits is like being to a studio in person, in the company of an observant and wise companion.